As stated in the previous Section, pharmacotherapy provides the foundation for the optimal treatment of borderline disorder. It has now been accepted by most experts in the field that the appropriate medications provide a significant reduction in certain symptoms of the disorder that are not treatable by psychotherapy alone. Very importantly, they promptly enhance the quality of your life and the efficacy of psychotherapy. However, medications contain no information. They do not provide you with alternative resolutions to problems that are more effective and less disruptive than those you may be currently utilizing. This is why I recommend the combined use medications and psychotherapy to achieve optimal results in the treatment of borderline disorder. Psychotherapy enables you to learn about the nature of borderline disorder as it affects you, and how to manage your symptoms more readily and effectively. For example, psychological and behavioral symptoms are the major manifestations of borderline disorder. They cause serious emotional pain and significantly disrupt the normal development of effective behavior and important relationships. It is critical that you have a safe, supportive, and effective relationship with a person who is able to help you learn about your illness, how it affects your life, and how to make those changes that will enable you to gain the best possible control over your emotions, impulsive behaviors, thought patterns, and the turbulent relationships that are characteristic of borderline disorder. A competent therapist fulfills these needs and serves in other important roles as well. Psychotherapy is essential if you are to gain optimal control over your symptoms and your life. There have been recent sea changes in the approach to the use of psychotherapy for borderline disorder. These developments promise to make therapy more available and increase its effectiveness for borderline and other personality disorders. It is most encouraging that an increasing number of therapists are learning the psychotherapy skills required to help patients with borderline disorder and are developing the experience necessary to use these skills effectively. If you locate a therapist who is in your locality and who has been trained and is experienced in one of the forms of BPD-specific psychotherapy, it will be helpful for you to know something about that specific approach. The following are brief descriptions of some of the most frequently used types of psychotherapy developed for the treatment of patients with borderline disorder. Note: It is the consensus of most experts in the field that no BPD-specific psychotherapy is superior to another. Each have their individual strengths and limitations. One of your major tasks, as noted elsewhere on this website, will be in locating a skilled therapist in a location convenient to you. Dialectical Behavior Therapy has been tested in more controlled studies than any other therapy for borderline disorder and is widely used. Marsha Linehan, a psychologist from the University of Washington in Seattle, developed DBT specifically for people with borderline disorder, especially those who engage in frequent self-destructive and self-injurious behaviors and who require frequent, brief hospitalizations for these behaviors. DBT is based on the theory that symptoms of borderline disorder result from biological impairments in the brain mechanisms that regulate emotional responses. The early behavioral effects of this impairment are magnified when a child with this heritable risk factor interacts with people who don’t understand, don’t validate their emotional pain, and don’t help them learn effective coping skills to reduce their suffering. 5. reduce and eliminate the use of medications. DBT therapy requires a significant time commitment. It consists of the combination of once a week individual psychotherapy by a DBT-certified therapist, a two and one-half hour DBT skills training session conducted in a group setting, and substantial home work assignments. It also requires weekly team meetings of the therapists involved in your care. Therefore, it is expensive to adhere to these time-consuming treatment components specified by DBT training manuals. In DBT, you are usually discouraged from using the hospital and medications as a means of controlling emotional tension, even though psychotherapeutic techniques are ineffective in achieving significant improvement with some symptoms and more time-consuming in achieving results that are effectively treated by this approach. The Underlying goal of treatment is to learn to manage the current emotional crisis in more effective ways. DBT has gained considerable favor in the treatment of borderline disorder because of the results it has achieved in multiple research studies, especially in reducing suicidality, self-injurious behaviors, and the frequency of hospitalizations, and in improving social adjustment. DBT can be taught to and be used by many mental health therapists. While there are workshops available for clinicians to learn more about DBT, a fully trained therapist must have attended a ten-day intensive course of training. Each year, more therapists are receiving this gold standard of DBT training, but there is no official certification of DBT therapists. It is important to recognize that the remaining borderline-specific psychotherapies are not as opposed to the use of medications as is DBT. Mentalization-based treatment was developed by Anthony Bateman and Peter Fonagy. As opposed to the theory underlying DBT, which assumes that borderline disorder is the result of the interaction of inherent emotional dysregulation combined with an invalidating environment, Bateman and Fonagy propose that borderline disorder is based on the interaction of inherited and acquired disturbances in specific brain processes that underpin the thought disruptive symptoms of the disorder. In other words, Bateman and Fonagy contend that individuals with borderline disorder have inherent, primary difficulties in thinking about (mentalizing) the symptoms of the disorder and their effects. Therefore, they see the primary problem is one of disturbed cognitive performance. This results in secondary disturbances in their emotional responses, impulse control, and interpersonal functioning because they cannot be integrated thoughtfully into a coherent whole. As a result of these primary difficulties, and of great importance to the development of positive and skilled relationships, changes in therapy are mediated mainly by the interactive work of the therapist and the patient. 4. Cognition, or the implicit and explicit perception and interpretation of oneself, other people, and events, and their coherent integration. In summary, the primary change mechanism in MBT is enhanced mentalization in the context of the attachment of the patient’s relationship with the therapist. TFP is another specialized form of therapy developed specifically for patients with borderline disorder. It is strongly based in psychodynamic principles. 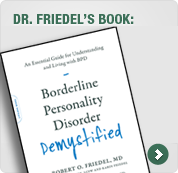 In contrast to many other forms of therapy for borderline disorder, it is proposed that psychological disturbances in the basic form or structure of personality underlie the specific symptoms of the disorder. The disturbances that divide an individual’s perceptions into extremes of bad and good are particularly important in TFP. This results in serious inconsistencies in both thoughts and feelings that determines the patient’s way of experiencing themselves and others. In brief, it determines their experiences and interpretations of reality. Treatment in TFP initially focuses on your establishing with the therapist a behavioral agreement that deals with the likely threats that may occur in the course of the treatment, both to the treatment and to your well-being. Therapy then moves on to modify primary psychological disturbances and reduce symptoms, mainly by examining, understanding and improving your interactions with your therapist. Psychodynamic psychotherapy of this type is not appropriate for all patients with borderline disorder. For example, some patients may not be able to tolerate the interpersonal emotions raised in the process of therapy, be in sufficient control of their impulsive behaviors, or have the time or finances to devote to the process. Also, not all psychotherapists have the training, experience and skill to provide this type of therapy for patients with borderline disorder. These issues should be raised with the therapist before TFP is undertaken. Schema-focused therapy offers a structured integration of the techniques of psychodynamic, supportive, and cognitive behavioral therapies. SFT is based on the premise that people with borderline disorder have a more rigid personality structure, chronic psychological problems, and deeply held but inaccurate belief systems. In an attempt to deal with these seemingly overwhelming challenges to therapy, SFT groups the behaviors into five modes, or schemas that the borderline patient “flips” through to attempt to cope with their difficulties. These five borderline modes are: 1) the abandoned and confused child; 2) the angry and impulsive child; 3) the detached protector; 4) the punitive parent; and 5) the healthy adult. The four mechanisms of healing and change underlying treatment of borderline disorder with SFT are 1) “limited re-parenting” by the therapist; 2) emotion-focused work–especially imagery and dialogues; 3) cognitive restructuring and education; and 4) behavioral pattern breaking. As is the case with all forms of psychotherapy for borderline disorder, the number of therapists specifically trained in SFT is very limited. Good Psychiatric Management is a comprehensive, integrated and highly structured approach to the treatment of borderline disorder that is based on the APA Practice Guideline for the Treatment of Patients With Borderline Personality Disorder. 30 It is a coherent, high standard, outpatient treatment model that includes case management, symptom-targeted medication management prioritized to the treatment of mood lability, impulsivity, and aggressiveness according to the APA Guideline, and psychodynamic psychotherapy. 38 It appears to be effective as DBT when used by psychiatrists and other therapists with some experience and interest in the treatment of borderline disorder. Conceptually, in STEPPS, borderline disorder is viewed as being a disorder of emotional and behavioral regulation, including perceptual disturbances such as all-or-nothing thinking (splitting). It was developed to address the major symptoms of the disorder, and to avoid the limitations of DBT and MBT (see below). DBT requires a greater time commitment (2 ½ hours per week of skills training for one year plus one hour with a DBT therapist trained by its developers compared to a 2 hour per week STEPPS classroom sessions over 20 weeks plus treatment with the current therapist.) The therapist requirement of DBT results in separation of patients from their current therapists, if they are able to locate therapists trained in DBT. MBT has been utilized mainly as an 18 month, treatment intensive, partial hospitalization program. The developers of STEPPS point out that DBT and MBT are not readily accessible, are labor intensive, time consuming and require substantial therapist training. STEPPS has been utilized in the US and in the Netherlands. It is now well established that significant disturbances in relationships are one of the four major dimensions of the specific symptoms of borderline disorder. A number of individuals with the disorder demonstrate improvement in group settings, especially in relationship skills. Group therapy settings can also help to improve emotional dyscontrol, impulsivity, and specific disturbances in perception, reasoning, and problem solving. Although it may be helpful, you should approach participation in such groups with caution. Considerable harm can be done if one or more individuals in the group act in an angry, manipulative, malicious, or otherwise inappropriate and destructive way toward another group member or the group as a whole. Without a trained leader or facilitator present to step in to handle the situation promptly and properly, a member of the group, and even the group itself, may be exposed to significant harm. Prior to joining a support group, you should seek recommendations about local groups from mental health professionals who work with people with borderline disorder. In addition, it may be helpful to re-quest information from members of such groups before joining.